Just because it's hot in the Mission doesn't mean you should head to the beach — not without checking Mr. Chilly, anyway. 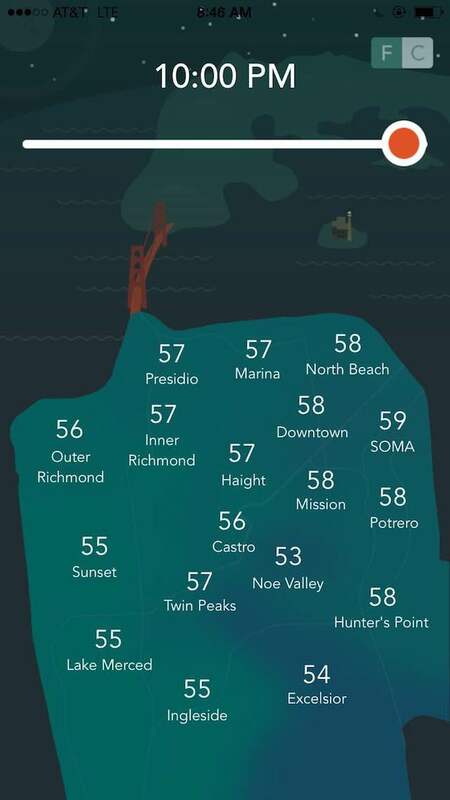 This new app for observing SF's various microclimates could soon be a go-to, with an adorably illustrated map that shows you what temperatures to expect throughout the day at various locations. Is it too cold for a bike ride in the Presidio? (Probably). Nice for a jaunt to the Excelsior? (Oftentimes). 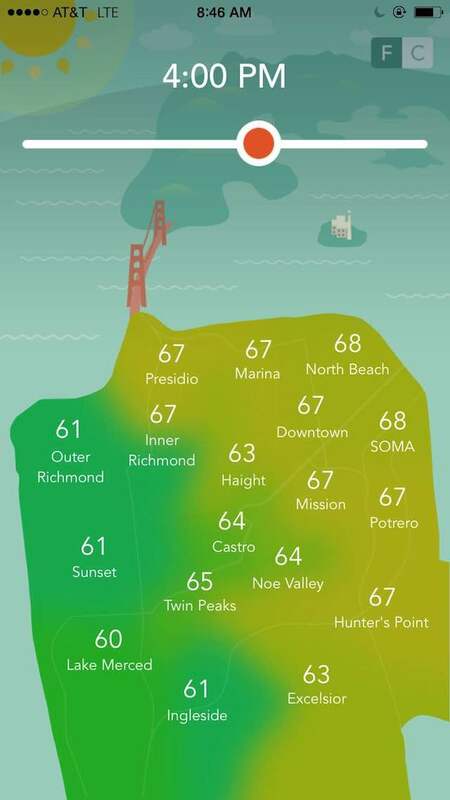 Though, for example, a similar app SF Climates has been around since 2012, Mr. Chilly does something similar with a bit more visual appeal. You can download Mr. Chilly in the Apple app store, but Android users are out of luck at the moment. Anna Bleker, a visual designer and developer who makes "bangin things" and researcher and developer Alexander Chia are the duo behind Mr. Chilly. Chia holds a bachelor's degree in computer science from Carnegie Mellon and a master's from Stanford, and Bleker works at Redshift, a "killer" design agency in SOMA [per Anna, she's now at a new startup]. The two met at a hackathon and decided to collaborate on the project, which they devised together, Bleker told SFist. "It took a while working on weekends for fun since we both work full-time," she noted. And this is just the beginning, she says, "We want to add more little animations here and there in the future. We've gotten some ideas like adding a sea lion that comes up in the water and goes back down." Probably the most requested feature would be a fog ma, and that's something Bleker has in mind for updates to the app. "I tried to figure out a way to make it look good, but decided to keep it simple for version 1."